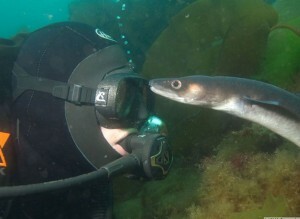 Conger eel in the Killary. Cillian Grey and Andrew Stuart to take you on a short dive to visit one of the best Conger Eel dive sites in Ireland. 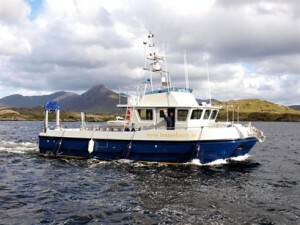 A recent diving experience off the western isles of Connemara by Jack. I first visited the west coast of Ireland way back in September 2008 when I flew out for a long weekend of diving, but this fleeting glimpse of the stunning countryside and spectacular underwater scenery only served to whet my appetite and made me determined to come back and explore it for a more extended period. But time rolls on, and it wasn’t until spring in 2009 that I really sat down and started to plan what I wanted to do. I knew that this time it was going to be a week-long roadtrip, which would allow me to view the Irish countryside in a more relaxed fashion. I wanted to drive from Suffolk up to Holyhead on the Isle of Anglesey in North Wales, catch a ferry across the Irish Sea and then drive from Dublin to the Scubadive West dive centre in Connemara. First on board was my dive buddy Paul Cushing, who had previously accompanied me on a long weekend roadtrip up to Scapa Flow in 2007. 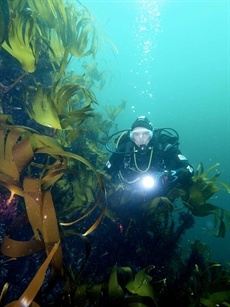 Paul is a keen cold-water diver, but he had never been to Ireland, and after hearing about the amazing visibility and prolific marine life I’d encountered on my previous visit, he was all set to go. We decided to head out in May, and duly booked our ferry tickets, organised our diving with Scubadive West and marked off the week on our wallplanners. Now all we needed was some transport, and rather than chug our way up in one of our pick-up trucks, a quick call to Land Rover secured us the use of a Land Rover Discovery 3 HSE, the perfect vehicle in which to travel with a shedload of diving equipment and two mountain bikes (Breffni and Cillian from Scubadive West had let slip about some superb mountain bike trails in the area, so we were well up for trying them out). Our epic trip set off early on a Friday morning, but the benefit of leaving Suffolk at 5am meant that we avoided any of the usual traffic on the A14 and the M6 enroute to North Wales and could get some serious miles under our belt. Once we were on the A5 wending its way through the valleys near Snowdonia, we could sit back, enjoy the comfortable ride of the Discovery – now fondly known as Blob (check out the numberplate) – and take in the dramatic scenery. We rolled into Holyhead harbour and parked up in our assigned loading lane, ready to board the ferry. We chose to take the high-speed catamaran, which only takes less than two hours to get across the Irish Sea, as opposed to nearer four hours in a normal passenger/car ferry. Mid-afternoon, we drove off the ship and headed through busy, bustling Dublin to the relative calm of the motorway to Galway. This motorway is almost complete, with only a couple of sections still under construction, but it makes the trip across Ireland a simple affair. From Galway, you are on smaller roads to Connemara and the Scubadive West dive centre, but you don’t mind that you are forced to drive slower to negotiate the sharp bends and avoid the odd errant sheep, it gives you more time to savour the awesome scenery unfolding all around you. Cloud-topped mountains form a spectacular backdrop to lush valleys crisscrossed with narrow roads and stone walls, and stunning bodies of water provide a deep blue contrast to the endless green. Blob soaked up the miles, and we were kept alert by swapping drivers every hour or so – never mind our seemingly bottomless supply of chocolate bars and cans of coke in our trusty Landy’s on board fridge, which nestled handily between the two front seats. Believe me, when you are doing a long drive, every car should have one! Up bright and early the next day, it was time to get wet, so we climbed back into the Land Rover and drove down to the dive centre. Breff, Cillian and Deirdre were there to meet us, and we were straight into the thick of things, boarding the Brazen Hussy for a two-dive trip to the offshore island of Inis Turk. The Brazen Hussy is a purpose-built catamaran owned and operated by skipper Shane Bisgood, and I have to say that it is probably the finest dayboat I have ever been on. The entire boat was designed and built to Shane’s specifications, and everything has been well thought out, from the twin keels up. 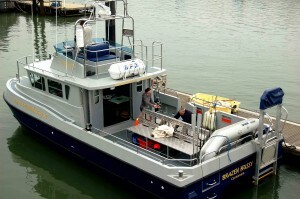 He works closely with Scubadive West, so it all had the diver in mind. The benches are extra-wide, so there is plenty of room for you and your cylinder(s), the diver-lift is fast and solid, the wide body and deep V hulls keeps the ride stable even in rough conditions, and there is a state-of-the-art three-dimensional underwater mapping system on board. You want real-time, actual images of the dive site you are going to explore? You’ve got it! There are even four different locations on the boat that Shane can pilot from – the wheelhouse, the flying bridge, the bow and even right next to the diver-lift. It is slightly disconcerting to see Shane standing next to the diver-lift and the boat backing towards you until you remember that he is still driving even though he is right there! Boarding the Hussy, I was stunned at the sheer amount of room on the dive deck. Shane’s previous Brazen Hussy was an offshore 105, limited to 12 divers, and the same limits apply on the new boat, despite it being twice as wide, so you have acres of space to spread out and get your kit sorted. 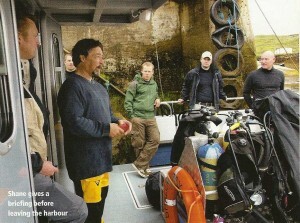 All the divers and gear aboard, we motored out of the harbour and towards Inis Turk. The offshore islands of Inis Boffin, Inis Turk and Clare Island are dotted with spectacular dive sites which benefit from excellent visibility and profuse coral and sponge growth. Our first dive site featured a large crevice which cut deep back into the sheer wall of the island, and underwater this vertical drop continued into a series of gullies before plummeting into the deep. The walls were smothered in plumose anemones, dahlia anemones, dead man’s fingers, encrusting corals and cup corals in myriad colours. The vis was in excess of 25 metres and light penetration was good even at 30m plus, but turn your torch on and shine it along the walls and the true vibrant colours burst forth. Absolutely mind-blowing – it was just as vivid as dive sites in the Indo-Pacific. As well as the marine life covering the walls and seabed, there were also shoaling pollack, cod and bib overhead, and in and around the swirling kelp beds were large curious wrasse. Edible and velvet swimming crabs could be found clinging to rocky outcrops or nestling in crevices, and lobster would wave their antennae from deep inside their lairs. Dogfish lolled on the sand patches, and the odd scallop would launch itself out of the silt and jet furiously away if you got too close. Look closer and you could find tiny cushion stars and various species of nudibranch. The next site was in a tight bay, and at the rear of this you could find a tunnel going a fair distance into the island. Large rocks blocked your passage at times, and you have to go over or under them, depending on how they lay. Again, the visibility was outstanding, and the bright-red encrusting growth on the cave walls looked amazing. Outside of the cave, large kelp beds sheltered all manner of marine life, and again depths quickly dropped off to beyond recreational diving limits. Paul was virtually speechless after his first two Irish dives, but the excited chatter of the other divers on board – all veteran Ireland divers from the local area – served to hammer home just how special the diving is around these tiny offshore islands. If you find yourself in this part of the world, believe me, you do not want to miss a dive trip out to Inis Boffin, Inis Turk and Clare Island. Back in the harbour, we loaded all our wet gear into Blob and headed to the Bard’s Den for some post-dive pints of Guinness and a juicy steak with the crew from Scubadive West. It was only day one and Ireland had already lived up to its earlier promise of superb diving. The diving off the west coast of Ireland is simply spectacular, especially around the offshore islands, and driving there turned the whole trip into a fun adventure.